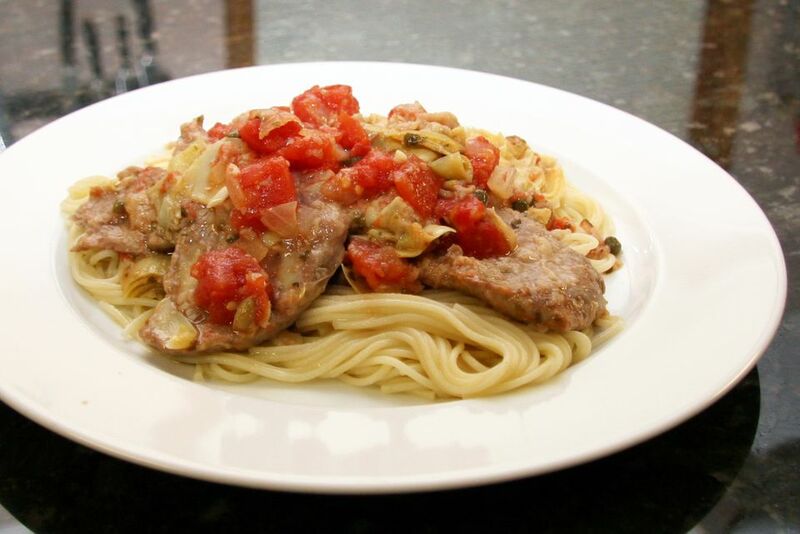 This veal recipe is made with thin sliced veal (scallopini) and tomatoes, along with capers, mushrooms, and seasonings. It is a fabulous dish to serve with hot cooked pasta. Add a salad and some garlic bread and you will have a wonderful meal. Combine flour, salt, and pepper in a bowl; dredge veal with flour mixture. Put the vegetable oil in a large skillet and place it over medium heat. Brown the veal in the hot vegetable oil, turning to brown both sides. Remove meat; add onion to skillet and cook until tender. Add garlic, cooked veal, tomatoes, mushrooms with liquid, parsley, capers, and oregano. Cover and simmer for 15 to 20 minutes, or until veal is tender. Arrange veal scaloppini over hot buttered pasta and top with sauce.